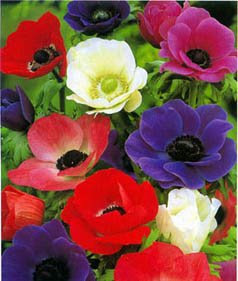 The Anemone (coronaria) flowers belong to the Ranunculaceae family, it is oneof 120 species of anemone. the anemone is amulti annual geophyte, worldwideit is mostly common in areas of mild or cool climate,mostly in the northern halfof the globe, while in places like israel it is common from the snowy northdown to the deserts of south israel. its colors , red , white or shades of purple ( moving from purple blue to purple pink), the most common flower is red. it bllooms in the months between january and march. the anemone is protected by law. and so you may not pick them when encountering them in nature. DeliverFlower.info - links to Flower directory resources and information websites.